The exciting next chapter in the awesome Sins of a Solar Empire universe has arrived. 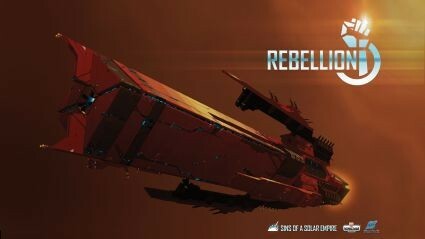 A full-fledged expansion to the original, Sins of a Solar Empire: Rebellion draws you even deeper into the galactic struggle for supremacy with appealing new factions, terrifyingly cool new ships of all sizes, enhanced lighting and particle effects for increased visual pleasure and all-new victory conditions. In the original award-winning Sins of a Solar Empire, developed by Ironclad Games, you are the leader of one of three civilizations embroiled in a galactic war, fighting for survival of your entire race against relentless foes. Your success will depend on your ability to manage your empire and command your vast fleets of starships to victory. Players will colonize new worlds, develop extensive trade networks, conduct research, fortify their empires with powerful starbases and fleets of ships, plus control the galaxy using the unique diplomacy system that reacts dynamically to the players’ actions. New Factions: Players decide whether to become Loyalists or Rebels, which unlocks a unique new tech tree granting them new technologies and ship variants. New Titan-class ships: Massive warships for each race that dwarf capital ships, these deadly new monsters are capable of wiping out entire enemy fleets single-handedly. New Capital Ships: A new capital ship class arrives, giving players new strategic options. New Corvette-class ships: Small, highly maneuverable light ships that are adept at a variety of tasks. Loyalist and Rebel versions of some of the existing Sins’ frigates and cruisers, each with their own unique strengths and weaknesses. Updated lighting and particle effects for enhanced visuals. New Victory Conditions to allow for more variety, differing strategies and shorter game sessions. Additional capital ship ability levels, for greater strategic choice. Impulse::Reactor support for chat, friends, achievements and more. Titan Shippppsss! FTW. can't wait. Plz come out on time! Holy crap insta want. Diplomacy was kinda meh, this sounds amazing. Awesomesauce, with 100% more awesome! And sauce. This'll be fun. So.. when's the beta test? Are we finally going to find out what the Vasari are running from? Muwahahahahaah! It will be mine...oh yes---it will be mine. Man, this game should sooo become an MMO. Errr...tell me he isn't spoofing us. Also, we demand screenshots. Like this. holy fracking crap! I WANT IT NOW!! I just realzied too that I've been seeing that emblem in game on minor faction ships a lot. They attack a lot. trinity's "experiance the complete sins" is a LIEEE!@!! !1 "
That'd be the ships spawned by TEC's Insurgency tech. ehh, since this is standalone, can we call this sins 1.5, I guess? Since this is a bigger expansion, is there going to be any work done on multithreading? Trinity on a big map can bring a single core on my i7 to its knees while the others are bored, let's spread the fun! THX Guys for this gift! YEEEAAAHHHHHH, This has made my day. Sins of a Solar Empire: Rebellion is expected to be released in late 2011; however a Stardock representative told us the company is taking the "done when it's done" approach to development. Sweet, cant wait, any screenshots for the new titan class ships? Nice Screen shot...where did it come from? What's the release date on this? So will this have all previous Sins expansions "bundled in", or is it standalone in the way that Dawn of War expansions are usually handled... i.e., you can play with the features/components/factions of what you have purchased? Or is this basically Sins2 and is a whole different game? I hope HOPE there is a faction of Vasari that is anti slavery and views the inhabitants of the galaxy as equals, worthy of respect.